Hey guys! How’s it going? 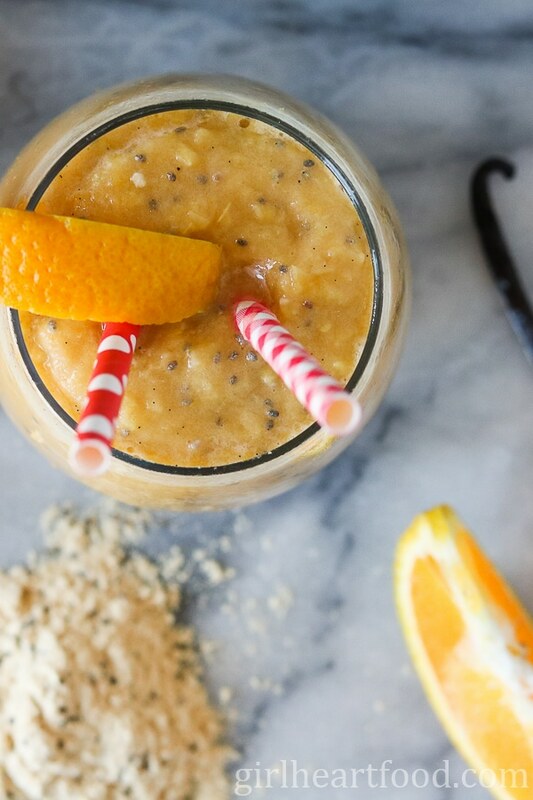 Today I’m stopping in real quick with this freakin’ delish Creamy Orange and Vanilla Smoothie. You know I love my smoothies! Two of the most popular ones here on Girl Heart Food are my Peanut Butter Banana, Cocoa & Coffee Smoothie and my Blackberry Coconut Smoothie. The key here is to use frozen orange segments. It gives a thick body to the smoothie, almost like a frozen banana would. Wearing my fancy pants again, I used real vanilla bean here and just loved the little flecks of it throughout. However, if you don’t have vanilla bean on hand, feel free to use pure vanilla extract. You basically have to put all the ingredients in a blender and mix until smooth. Nothing to it, right? I’m confident that you’re gonna love this one! Until next time, take care & chit chat again soon 🙂 Have an awesome food-filled weekend! This Creamy Orange and Vanilla Smoothie is packed with real orange and vanilla flavour and for extra oomph has vanilla protein powder. It's a delicious way to start your day or to get over that mid afternoon slump! Plus, it tastes like a favourite childhood frozen treat in smoothie form! Combine all ingredients in a blender and blend until smooth and combined. Pour into glasses and garnish with orange wedge, if desired. Enjoy! 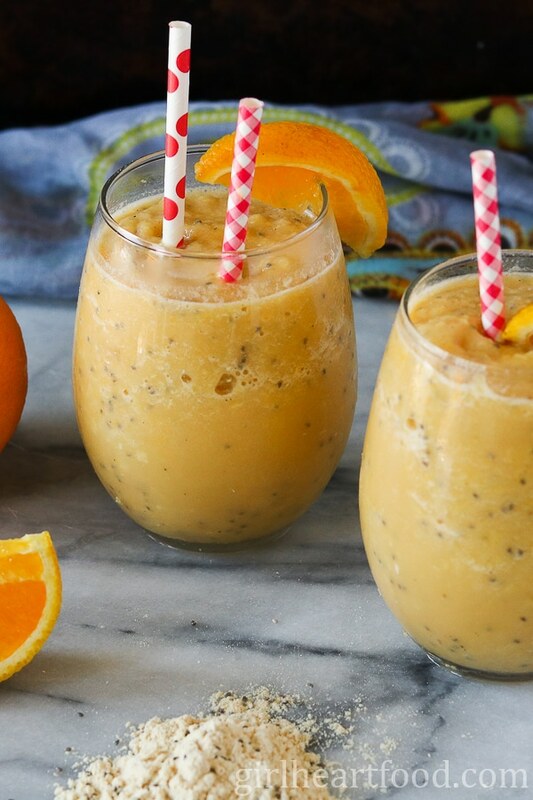 I have been craving oranges this summer so badly and this smoothie just made it to the top of my list to try. It looks so cold and refreshing if I had all the ingredients it would already be blending. That recipes sounds so refreshing and filling. The perfect breakfast to keep you going on these hot summer days. YES! Creamsicles were sooo good! This smoothie looks amazing and so easy to make too. For me, the childhood treat of my dreams had to be Little Debbie brownies though. My mom would never, ever buy them but I would use my birthday money to stash a few boxes away, haha. two totally great taste combinations. I always loved orange smoothies and this would be gone in 60 seconds here lol love it! 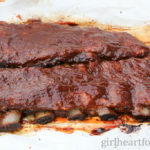 Healthy and delicious for the win! I normally don’t start my days with a smoothie, because – I have no explanation – but once I’ve had a huge glass of smoothie, I will likely be starving in 30 minutes hah. There are only two ingredients which make my smoothies a good meal, oats and peanut butter. Well, I haven’t really though of protein which should work well too. Very nice smoothie you’ve got here! This looks like the perfect smoothie! I’m with you! Creamsicles were my absolute favorite frozen treat growing up and I haven’t had one in years! Love this grown-up version. Lucky you with the orange tree – that’s awesome!! Hope you enjoy it 🙂 Thanks Nicole! This looks so refreshing! Love this unique flavor for a smoothie, tasty!